In this section we are sharing some of the art work displayed at the Translation and Transmission Conference series, some important projects presented during sessions, and a list of useful links to resources relevant to the themes and topics of these conferences. The 2014 Translation and Transmission Conference hosted at the Keystone Conference Center displayed three remarkable timelines produced by Tsadra Foundation. We are pleased to share them here for free download and for personal use. Please contact us at conferences@tsadra.org if you would like to use any of these timelines in any public event. The Translation and Transmission Conferences provide the space for presenting and discussing important translation projects, Tibetan Buddhist libraries, and digital tools for translators and researchers. If you would like to display your project here, please contact us at conferences@tsadra.org. 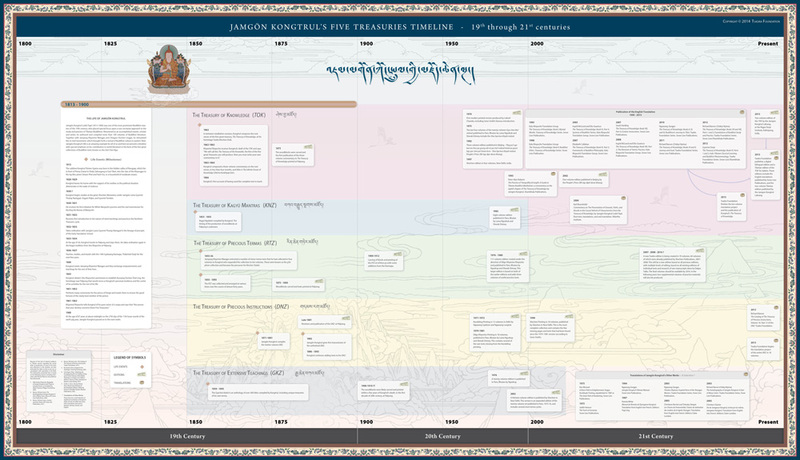 The Timeless Treasuries library is a free public repository of Tibetan Buddhist literature. Explore and download e-books generously provided by prominent monastery-based publishers of the Tibetan Buddhist traditions. This project has been developed by the Tibetan Publications and Digital Publications departments at Tsadra Foundation in collaboration with more than twelve Tibetan Buddhist publishers. This catalog presents information about each of the texts in the 70 volume Shechen Edition of the Rinchen Terdzö Chenmo, The Great Treasury of Rediscovered Teachings. This unique collection is the largest of the five treasuries that Jamgön Kongtrul the Great compiled throughout his life and is comprised of the many Rediscovered Teachings (gter ma) of Tibetan Buddhism. the Columbia University Center for Buddhist Studies (CCBS). It is quickly becoming an essential resource for translators and scholars working with canonical Buddhist texts or references to any texts in the Kangyur and Tengyur. Recent updates include expanded bibliographic coverage, full-text searching, and Machine-assisted translation services, which continue to be in development. A CAT (Computer Assisted Translation) tool is a computer program that assists translators by making it easier to parse and translate texts through segmenting source texts, displaying the source and translation side-by-side for ease of use, referencing previously translated pieces of text and storing translation choices. CAT tools are used by most professional translators of modern languages and can be of use to translators of Tibetan texts as well. Dirk and Ngawang from Esukhia have provided information to help you get started. This catalog, referred to as the “DNZ,” is a database of information covering the eighteen volumes of Jamgön Kongtrul’s Treasury of Instructions: Essential Teachings of the Eight Practice Lineages of Tibetan Buddhism (gDams ngag rin po che’i mdzod), including detailed information about each text, such as size, location, lists of people associated with each text, lineage data, lists of translations available, and comparisons with previous catalogs. For research purposes, all colophons, text titles, and author names are recorded in both Extended Wylie and Unicode Tibetan. The Annotated Corpora of Classical Tibetan (ACTib) is a corpus containing 80 million words of Classical Tibetan has been available in Sketch Engine since spring 2017. Corpus texts were taken from the e-text collection of the Buddhist Digital Resource Center (BDRC). The ACTiB corpus was lemmatized and part-of-speech tagged. A word sketch grammar for the Tibetan language enables users to explore the grammatical and collocational behavior of Tibetan words. The TBRC has expanded and become the BDRC with a new vision for the future of digital humanities in support of Buddhist textual research and preservation. You can now access the wealth of Tibetan texts on your iPad or Android device: download the BDRC app at Google Play and the App Store. The Buddhist Digital Resource Center is a 501(c)(3) nonprofit organization dedicated to seeking out, preserving, organizing, and disseminating Buddhist literature. The Nitartha Digital Library presents searchable digital Tibetan texts using the open source digital library software package XTF, which is very flexible and allows for input of large amounts of text and ease of search. Lama Tenam and Gerry Wiener, creators of the Sambhota font, have worked on this project for several years and it is now available to the public. This is a selection of links to resources relevant to the themes and topics of the Translation and Transmission Conference series. If you would like to include missing links to important resources, please contact us at conferences@tsadra.org. Tsadra Foundation is a privately funded nonprofit trust established in New York City in 2000. We provide vital funding for the combined study and practice of Tibetan Buddhism in the west. The mission of the Translation & Transmission Conferences is to provide an international forum for sustained dialogue and the sharing of experiences related to the translation and transmission of Tibetan Buddhism in the west. If you would like to contribute to the conference or donate to the scholarship fund for those who wish to attend but need assistance, please click the link below.